Ray: You kinda like that song, don't you, Mrs. Loomis? Rose: There isn't any other song. That classic honeymoon destination is the spot for this nasty little tale of love gone wrong, and it is, in many respects, the bid to turn Marilyn Monroe into one of the great noir dames, alongside Barbara Stanwyck in Double Indemnity, or Lana Turner in The Postman Always Rings Twice, or Rita Hayworth in Gilda. (This movie comes by its pedigree rightfully: the producer and one of the credited screenwriters is Charles Brackett, who was Billy Wilder's writing partner early in their careers; their most successful collaboration is almost certainly Sunset Boulevard.) It's only partially successful on this score, in large measure because of some peculiar storytelling choices. Monroe plays Rose, who is holed up in a cabin on the Canadian side of the falls with her husband, George, played by Joseph Cotten. She's taken to the bed, to avoid having to speak with her spouse—she's awake, but doesn't want him to know, because who needs to talk to him? He tries to tiptoe around, so as not to disturb her, though he seems reasonably disturbed himself. (In some respects, this is an inversion of the opening of Shadow of a Doubt, which features Cotten as the voluntarily bedridden, unbalanced one.) Once they're up and about, we see that she may be a tart, or he may be crazy, or both. This is great raw material—she's on her way out and she's flaunting it ("I'm meeting somebody. Just anybody handy, as long as he's a man"), and he'll tell anybody who'll listen what conclusion he's reached: "She's a tramp! I tell you now, so you don't have to ask." The wheels are set in motion, and our curiosity is piqued, when we hear her side of a phone conversation: "Listen, it's got to be tomorrow." No good can come of all this. But instead of focusing on the femme fatale (the classic noir story) or on the cuckolded husband (as the Coens do in The Man Who Wasn't There), Niagara concentrates instead on another couple at the cabins, who blithely pull up in their convertible and announce: "We're the Cutlers!" They're new in town from Toledo, and Ray Cutler (Max Showalter) is going to work at the shredded wheat plant in the vicinity; this trip is his much-delayed honeymoon with his wife of three years, Polly (played by Jean Peters). Far too much screen time is devoted to these two, and to the boss in the shredded wheat business to whom Ray wants to kiss up; they're necessary to keep the plot moving, but in a picture that runs less than an hour and a half, you can't help but feel that you're being cheated out of seeing the real action, with Monroe and Cotten. On their first trip to the falls, Roy and Polly discover that Rose, who said she was going to the grocery, is instead swapping spit with some side of beef. Is she just stepping out on him, or is she evil? As with so many unhappily married couples in these movies, the wonder isn't that things turn ugly between Rose and George; it's that these two got married in the first place. (Cotten is not quite as henpecked as Elisha Cook Jr. in The Killing, but he's not far behind.) Though it isn't spelled out explicitly, it soon becomes obvious that Rose and her new man are teaming up to take care of poor old George, back in the cabin. Of course, you know what happens to the best laid plans. If the Cutlers are a fairly clumsy story device, their presence provides some psychological depth to the story; the notes aren't hit too hard, but there's a lot of mistaking of one couple for the other, and especially deliberate confusion between the two women. The Loomises occupy the cabin the Cutlers have reserved; Mr. Cutler wants to know why his wife can't wear a dress like Mrs. Loomis's (it's the one featured on the DVD cover, and it's a honey); and there's a definite good girl/bad girl dynamic set up between the two women. There are more than a few similarities between this movie and Vertigo, as this psychological doubling suggests; both movies even feature bits of climactic action set in a bell tower, and when Niagara is exploring this aspect of its subtext or is adhering to staples of the genre, it largely gets it right. But that isn't often enough, and a certain amount of psychological intrigue doesn't really make up for the lack of backstory, or even of story, really—for instance, Marilyn's partner in crime, the fellow with whom she's stepping out on her husband, doesn't even rate a name. (We do get just a few strands of the history of Rose and George—he relates their meeting, when she was working as a beer hall waitress in Duluth: "I guess it was the way she put the beer on the table.") Smoldering and oblique are fine; they're staples of noir, but this story seems lacking in drama. Too many pivotal story points happen off screen, and more time with the Cutlers is no substitute. Mr. Cutler particularly is something of a simp—his big professional claim to fame is a recipe for turkey stuffed with shredded wheat (because, you know, usually turkey just isn't dry enough), and the backslapping boss showing them around is even more insufferable than they are. You want to shove them off the screen and get back to Cotten and Monroe getting down and dirty. The two lead performers turn in good work, but they simply aren't given enough to work with. It's too bad, because with more to sink her teeth into, Monroe could have explored the darkness she brought the previous year to Don't Bother To Knock, and Cotten is to my mind one of the all-time great movie actors, playing both good guys (The Magnificent Ambersons, The Third Man) and bad guys (the aforementioned Shadow of a Doubt.) If only the filmmakers had packed off the Cutlers to the shredded wheat factory, or left them in Toledo, and had kept focus on the betrayals in the marriage that should be at the center of the story. Image Transfer Review: The deeply saturated palette of colors here look exceptionally good; greens and blues are especially lush, which I suppose is what you want in a movie in which water plays such a prominent role. Transfer to DVD looks quite fine, with consistent blacks and a minimal amount of debris. Audio Transfer Review: It seems to have been a choice made by the filmmakers, but sometimes the sound of the falls cascading down is so unbelievably loud that it skews the dynamic level of much of the movie. (Also, in classic Hollywood tradition, when it's necessary for the story, characters can shout to one another over the falls at great distances and be heard with perfect clarity, despite the obvious impossibility of this in real life.) Things get very loud especially in the last half hour, with the story's climax on the water; it's a nice aesthetic decision to use the rush of the water instead of music, and here things tend to even out in the stereo mix. Extras Review: Although the feature is in glorious Technicolor, the trailer is in black & white; what's more jarring is how much of the plot it gives away in just a couple of minutes. And it sure is loaded with hyperbole: "A raging torrent of emotion that even nature can't control!" "Marilyn Monroe as the tantalizing temptress whose kisses fire men's souls!" 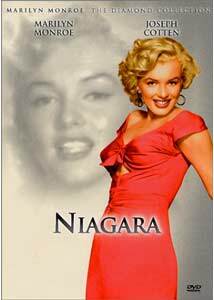 "Niagara and Marilyn Monroe: The High Water Mark in Suspense!" The featurette (01m:15s) is a restoration comparison; the still gallery, twenty-one images, including several of what look like stills from costume tests, some of which didn't make it into Monroe's wardrobe for the picture. Demerits go to the copywriter or editor responsible for the DVD case, in which the leading man's surname is misspelled ("Cotton" instead of Cotten), and Monroe's performance is described as "facinating." Niagara isn't a top-flight entry in its genre, but some evocative atmospherics and a satisfying DVD transfer make it worth a look. Monroe and Cotten turn in fine performances in nicely contrasting style; the story sort of lets them down, however, and hence the movie doesn't pack the punch that it otherwise might have.